Photo: Antoine Blanc Gingras House and Trading Post, ca. 1845, Walhalla, ND. Listed on the National Register of Historic Places in 1975. Gingras, a Canadian Metis Indian, owned a number of trading posts across the Dakota Territory. Photographed by user:Elcajonfarms, 2007, (own work) [cc-by-3.0 (http://creativecommons.org/licenses/by/3.0)], via Wikimedia Commons, accessed October, 2012. Motto: "Liberty and Union, now and forever, one and inseparable"
The name Dakota is a Sioux Indian word meaning friends or allies. In 1861 the U.S. Congress created the Dakota Territory from the Louisiana Purchase; it was comprised of what are today North Dakota & South Dakota, Montana and Wyoming. North Dakota was admitted into the Union November 2, 1889 becoming the 39th State; John Miller served as the first governor, and was succeeded in 1890 by Andrew H. Burke, a banker from Cass County. From the late 1800s through the early 1900s, the State's population increased by more than a quarter of a million people. Euro-American settlement in North Dakota did not effectively begin until the 1870's, due in large measure to the area's location well north of established transportation routes west of the Mississippi. In 1873, however, the Northern Pacific Railroad reached Bismarck, followed by the Great Northern (to Minot) in 1887. Construction of these lines facilitated emigration more directly from the east; heretofore would-be settlers had come via Nebraska and South Dakota. North Dakota's first large-scale settlement boom began about 1878 and lasted until around 1890, when the depression of the following decade brought it to an end. In the second boom, which began about 1898 as the nation's financial situation improved, transportation within the state was further expanded by construction of numerous branch lines off main railroad routes, and of the Soo Line, which served North Dakota by 1893. The notable population increases during this period prompted the subdivision of large counties into smaller political units. Among the counties so divided was McLean, in central North Dakota, from which Sheridan County was created in 1908. Dakota settlers, many of whom acquired farm land on the northern plains through the Homestead Act (1862), included a variety of nationalities, most from northern Europe. Among them were immigrants of German stock whose journey to the U.S. began not in Germany, but in Russia. Beginning in the early 18th century, agricultural families in southwestern Germany were lured to the Volga and Black Sea regions through generous provisions for land, the right to maintain their language and culture, and exemption from military duty. Czarist recruiting efforts occurred periodically into the 19th century, with the result that numerous colonies of Germans were established in southern Russia. In 1871, however, the government initiated a program of "Russianization" and conscription intended largely to bring the German colonists within the mainstream of Russian language and culture. In response many Germans left Russia, returning to Germany or emigrating to the United States. The first Russian-German colonies in the U.S., known as the Odessa Colonies, were founded in 1873 in Nebraska and South Dakota. Subsequently, Russian-Germans settled in many areas of the Central and Northern plains, including Wyoming, Colorado and North Dakota. They were active participants in North Dakota's "second boom," constituting a "considerable emigration" to areas around Harvey (northwestern Wells County, and eastern Sheridan County) at the turn of the century. 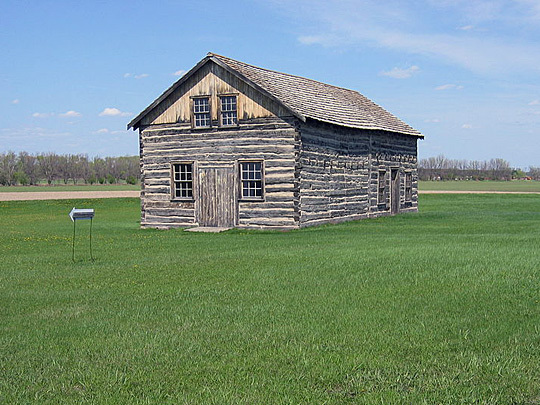 In North Dakota, the most common types of original rural domestic architecture were log cabins (at least while the scant supply of usable native timber lasted), and wood frame houses or shacks (erected often with lumber brought in, or even supplied by, the railroads). Unlike Nebraska settlers for example, who employed sod construction to a significant extent, North Dakota homesteaders made little use of this readily-available material. The chief exceptions were Russian-Germans, many of whom, in following traditions evolved out of their experience in treeless lands of Russia and the Ukraine, utilized earth in a variety of ways in the construction of their first dwellings. The basic form was simple: single story, with rooms arranged in linear fashion beneath a side-gable roof, which could be enlarged either longitudinally or by addition of rooms at the rear. The walls (which were commonly finished with plaster or whitewash) might be built up with sod, with sun-dried clay bricks, with tamped or rammed earth, or with puddled clay poured into wooden forms that were raised in stages to the desired height. A double plate was sometimes used to tie the wooden roof framing more firmly to the walls, and a form of summer beam might also be employed to ensure structural stability. A variety of building elements could be purchased by those who could afford them. Among these were doors, window sash, and dimensioned lumber, shipped via the railroads in carload lots to many towns and installed in numerous sod and clay houses throughout the Great Plains region. Houses so constructed, with their thick walls, were warm in winter, cool in summer, and if properly maintained could last many years. They constituted perhaps the most visible legacy of Russian-German emigration, derived from tradition, built with local materials, and finished with modest amenities made available through the railroads which were the primary agents of settlement on the Great Plains. Adapted from Daniel Winter House, Goodrich Vicinity, Sheridan, ND. Historic American Buildings Survey [HABS ND-18], memory.loc.gov, accessed November, 2011. The Daniel Winter House was recorded in September, 1983, by Dennett, Muessig, Ryan & Associates, Ltd. (Iowa City, Iowa) for Ethnoscience, (Billings, Montana) and the U.S. Bureau of Reclamation (Bismarck, North Dakota). The project team consisted of Hans Muessig, Project Director; Photographer and Photogrammetrist; Angela J. Schiller, Field Assistant; and Martha H. Bowers, Historian/Architectural Historian.